Exhaust gas cleaning system advocates have expressed their surprise and disappointment at Singapore's decision to ban open-loop scrubbing in its waters. The move was announced Friday by Maritime and Port Authority of Singapore (MPA) Chief Executive, Andrew Tan, to "protect the marine environment and ensure that the port waters are clean." Scrubber advocates including the Clean Shipping Alliance 2020 (CSA2020) and the Exhaust Gas Cleaning Systems Association (EGCSA) have repeatedly said there is no evidence that scrubber washwater is harmful to the sea. "CSA 2020 was disappointed to hear about this restriction, especially as it is unclear whether it is based on any solid scientific data. As Singapore is such a large bunkering and supply port this move will have an impact on many of our members as well as many of the other 150+ shipping companies that have already invested in exhaust gas cleaning systems (scrubbers)," a spokesperson for CSA2020 told Ship & Bunker. "We find it particularly surprising that such a radical decision, affecting hundreds of shipping companies and thousands of vessels, would be made without trying to understand the actual environmental performance of open loop scrubbers by investigating with or even consulting the companies that have committed significant resources in researching, testing and investing in this technology." Tan said Friday that ships fitted with open-loop scrubbers calling at Singapore will be required to use compliant fuel, while ships fitted with hybrid scrubbers will be required to switch to closed-loop operation. 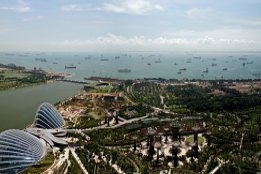 Singapore's ban goes into effect on January 1, 2020 alongside the start of the new global 0.50% sulfur cap on marine fuel, and follows a surge of interest in using scrubbers + HSFO to comply with the new rules.